iPro Property Management Software is an ideal solution for those managing holiday parks, caravan parks and lodges for short term stays. Whether you manage a small campsite, or large multi-lodge group, you can easily integrate all of your units into the iPro holiday rental software. Managing a large number of similar holiday lodges or rental flats can be very time consuming. By listing together in categories, rather than as individual units, you can greatly improve the efficiency of your booking process. Therefore, as each booking comes in, these will be automated allocated to a specific category, from where you decide the type of property (a great group-booking feature!). As the software is cloud-based, you can access booking alerts from any device at anytime. No need to be at your office desk to keep your business moving along! The iPro property management module is an is essential feature for holiday parks as it makes maintenance incredibly easy for multiple units. Be this managing several changeover cleans, gas and fire safety checks, or a sudden need for a caravan repair - iPro can be moulded around your business model. With the iPro dashboard you can easily see your holiday park’s bookings, lodge occupancy rates, seasonal trends and analyze your business performance as a whole. A key feature in planning for the future. iPro’s Customer Relationship Manager (CRM) will likely change your whole business model. By tracking every customer interaction you can develop a broad picture of what appeals to who, and why. From this you can assess where to improve, and identify opportunities for converting leads to guests. Furthermore, iPro’s holiday CRM is an incredibly useful tool to enhance your company’s client service. 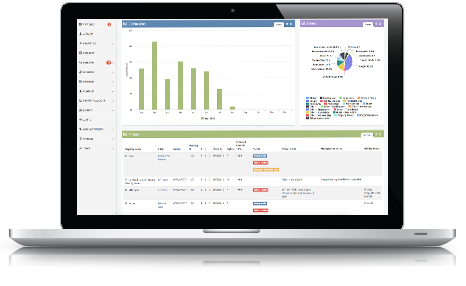 Not only will each customer have a recorded history with you, but the complaint tracking module will enable your team to track and act upon these instantly. iPro Software will provide you with a series of email templates which you can easily customize. Holiday parks and lodges are infamous for their activities, so why not factor these in your booking software? Whether your holiday park has kayaking, mountain biking, a swimming pool or jet skis, it is easy to tailor the iPro system to include these. iPro is an all-encompassing booking software for holiday lodges and parks. Find yourself more organised and time-efficient when you can manage property maintenance, bookings, and customer communications all from one platform. You can also increase the exposure of your holiday park properties via our Channel Manager. Think the iPro Software could help change your business for the better? Then get in contact with the iPro team today! We’d be happy to answer any questions you may have. You can also book your free demo here.